While authoring my forthcoming book, I have read many professional books. This is the fifth in a series of professional book reviews–possible titles for your summer reading. The reviews are in no particular order. 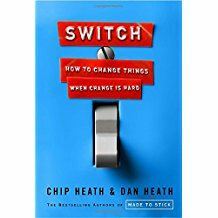 Chip Heath and Dan Heath’s book Switch: How to Change Things When Change is Hard is a must-read for anyone seeking to change the behaviors of a group of people. I also found this book helpful for thinking about changes in my personal and family life as well. During the months of March and April, 2017, I had the pleasure of participating in a slow Twitter chat with the school library Supervisors’ Section (SPVS) of the American Association of School Librarians. Our hashtag was #aaslspvschat. Thank you especially to Lori Donovan (@LoriDonovan14) for organizing the chat and posting the question prompts. Lori’s questions and chat participants’ responses furthered my thinking about Switch. Connections to Switch: I literally have thousands of examples that affirm Heath and Heath’s statement: “For individuals’ behavior to change, you’ve got to influence not only their environment but their hearts and minds. The problem is this: Often the heart and mind disagree. Fervently” (5). In Switch, the authors offer a three-part process for helping people make behavioral changes. They describe these as “directing the Rider” (the rational mind), “motivating the Elephant” (the emotions), and “shaping the Path” (the environment). They note that each person has both a “rider” and an “elephant” side that leaders must consider and successfully reach in order to influence behavior. “If you want to change things, you’ve got to appeal to both. The Rider provides the planning and direction, and the Elephant provides the energy” (8). Change agents are also responsible for ensuring that there are no obstacles in the path that would keep people from actualizing the desired change. Shaping the path can also involve helping people establish new habits and making the target outcomes contagious among group members. In my experience, I have found this to be true: “When change efforts fail, it’s usually the Elephant’s fault, since the kinds of change we want typically involve short-term sacrifices for long-term payoffs” (7). So much of what we are about in education requires the long view. Direct the Rider: Provide crystal-clear directions. Motivate the Elephant: Engage people’s emotional sides. Shape the Path: What looks like a people problem is often a situation problem (17-18). One way to “direct the Rider” is to point out “bright spots.” These are examples of where the change is underway and working well. In my experience, to be effective, this type of sharing has to happen in a non-competitive, sharing faculty culture, or in what George Couros calls a culture with “competitive collaboration” where educators push one another to improve. For example, if coteaching is the change we want to see, administrators can point to the classroom teacher-school librarian instructional partnerships that are “working.” They can share data that points to coplanning, coimplementing, and coassessing learning as the path to increased student motivation and improved learning outcomes. They can point out that coteaching educators are continually learning, less stressed, and are more fulfilled in their work. The problem of teacher isolation has a long tradition in schools. School librarians who begin to break down the walls between classrooms and libraries by coteaching with just a few teachers may feel as though they are not doing enough… when in fact they are “shrinking the change.” They are also helping the administration to “engineer early successes” (141). These successes give hope which is “precious to a change effort. It’s Elephant fuel” (141). By coteaching with a few willing partners, school librarians are helping to gradually move the faculty forward toward job-embedded professional development in a culture of collaboration—one educator, one grade level, one discipline department at a time. Administrators and their teaching partners should assure school librarians that “big problems (like teacher isolation) are rarely solved with commensurately big solutions. Instead, they are most often solved by a sequence of small solutions, sometimes over weeks, sometimes over decades” (44). In the example of building a culture of collaboration, hopefully not decades!!! Chip and Dan Heath have also coauthored Made to Stick: Why Some Ideas Survive and Others Die (2007). I highly recommend both of these books for anyone exploring the change process in their professional or personal lives. Heath, Chip, and Dan Heath. Switch: How to Change Things When Change is Hard. New York: Broadway Books, 2010. While authoring my forthcoming book, I have read many professional books. This is the fourth in a series of professional book reviews–possible titles for your summer reading. The reviews are in no particular order. This book seems the perfect segue from last week’s review of George Couros’s The Innovator’s Mindset. 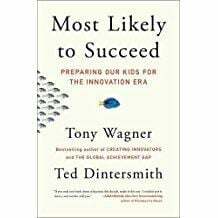 In Most Likely to Succeed: Preparing Our Kids for the Innovation Era authors Tony Wagner and Ted Dintersmith offered me a great deal of food for thought. These were some of their ideas that prompted my thinking. “The role of education is no longer to teach content, but to help our children learn—in a world that rewards innovation and punishes the formulaic” (197). This quote relates directly to what I think is one of the core beliefs of many (school librarians) who promote future-ready learning. Wagner and Dintersmith go on to qualify this idea with an acknowledgement that a certain level of knowledge is necessary in order for students to be creative and innovative. “You cannot teach critical thinking without engaging students in rich and challenging academic content. The goal must be to choose the academic content selectively so as to create the required foundation for lifelong learning, without letting the quest for content coverage overwhelm the development of core competencies” (224). • Work hard because they are intrinsically motivated (205). All of these relate to my understanding of the goals of inquiry and future-ready learning. The authors recommend that student-curated digital portfolios that show evidence of these principles is an effective way to document student learning. I agree with Wagner and Dintersmith that educators should also be evaluated using digital portfolios. Educators’ documentation could serve as personalized accountability (232-233). These portfolios could include video-captured lessons and examples of students’ work that shows improvement and the impact of educators’ teaching. They could include focus-group feedback from students with regard to how the educator did or did not achieve the principles cited above. To relate this to school librarian portfolios, the school library Web site or blog could be one aspect of such a portfolio. Linked learning plans and the resulting student work and feedback from coteachers, administrators, and other library stakeholders could show how school librarians hold themselves accountable for improving learning and teaching in their schools. With an understanding that internally motivated students will continue to learn new knowledge and skills throughout their lifetimes, Wagner and Dintersmith write this: “So, the first question we must ask ourselves about any proposed change in education is: Will this ‘improvement’ likely increase or diminish student motivation for learning and how will be know? And to be clear, we’re not just talking about the thrill factor of learning. We are talking about the motivations that include grit, perseverance, and self-discipline” (223). I know this question will continue to stick with me. Without intrinsic motivation, learning simply will not happen. Tony Wagner, an “expert in residence” at Harvard University’s Innovation Lab, has authored other books, including Creating Innovators and The Global Achievement Gap. Ted Dintersmith is a “partner emeritus” at a venture capital firm. Their collaboration on Most Likely to Succeed makes it a compelling read for those seeking to prepare future-ready students and transforming schools into future-ready learning environments. Wagner, Tony, and Ted Dintersmith. Most Likely to Succeed: Preparing Our Kids for the Innovation Era. New York: Scribner, 2015. Note: I would like to acknowledge Dr. Wagner for responding to series of emails with my questions. Many authors and speakers invite that kind of follow-up but not all of them follow through. Thank you. While authoring my forthcoming book, I have read many professional books. This is the third in a series of professional book reviews–possible titles for your summer reading. The reviews are in no particular order. I don’t remember when I first heard about George Couros. As soon as I did and before I read his book, I began reading his The Principal of Change blog, receiving his daily email blasts, and following him on Twitter (@gcouros). …as does his book The Innovator’s Mindset: Empower Learning, Unleash Talent, and Lead a Culture of Creativity. On the paperback book cover, these keywords appear in red font: “innovator’s” (bold), “learning,” “talent,” and “creativity” (in an artistic font). 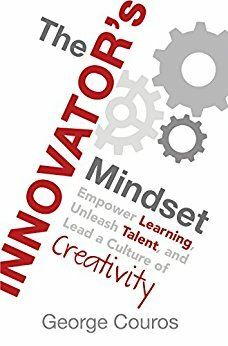 With bolded and branded #InnovatorsMindset insets through the 232-page book, Couros’s book is a thoughtful, accessible book–one that school leaders will turn to again and again. Couros makes a strong case for his premise: “There is a clear need for innovation in education” (4). He divides his book into three parts: a discussion of innovation, the foundation for a culture of innovation, and acting in an environment where change is possible. With a nod to Simon Sinek, George Couros clearly states his “why.” He believes “education’s why is to develop learners and leaders who will create a better present and future” (18). Couros goes on to define what he means in using the terms “learners” and “leaders.” All school stakeholders—young or more seasoned, students or educators—must inspire innovation both as learners and as leaders. I use Couros’s definition for “innovation” in the book I am writing: “Innovation is a way of thinking that creates something new and better.” I especially appreciate his emphasis on innovation as “a way of thinking” rather than a thing, task, or tool. An innovator’s mindset impacts school culture. I part with Couros a bit on his assessment that “establishing an innovative culture doesn’t require transformation” (20). I do think it may very well take something “dramatic” in many school cultures that seek to “develop and sustain systems that support ‘optimal learning experience’” for all stakeholders. I wonder if small tweaks and nudges are enough to respond to the urgency for change that many educators, students, families, and community members feel. Couros believes that it is “not that teachers don’t want to change, but they sometimes lack clear guidance and support to make the desired change” (47). I share this belief and it makes a strong connection for me with the book Switch: How to Make Change When Change is Hard by Chip Heath and Dan Heath (to be reviewed later this summer on this blog). Educators, like students, require leaders who clear the path and model the change they expect to see. Couros lists “8 characteristics of the innovator’s mindset” (pp. 48 – 58). He notes these characteristics can apply to everyone involved in education: empathetic, problem finders/solvers, risk takers, networked, observant, creators, resilient, and reflective. He also provides a similar set of characteristics for innovative leaders (pp. 88 – 90). Couros discusses creating a vision, using technology as an accelerator, and effective professional development for educators. He includes “8 things to look for in today’s professional learning” and notes that “understanding the learning opportunities that we would like to create for our students begins by immersing ourselves in similar experiences” (185). I could not agree more! Each chapter in Couros’s book ends with questions for discussion. His book and online resources provide a compelling book study selection for individuals and Professional Learning Communities. As Couros writes in his introduction, “Change is an opportunity to do something amazing” (3). If you’re someone who is open to change and don’t know where to start, begin by reading this book and then talk about it with your colleagues. It will inspire you! Couros, George. The Innovator’s Mindset: Empower Learning, Unleash Talent, and Lead in a Culture of Creativity. San Diego, CA: Dave Burgess Consulting, 2015. While authoring my forthcoming book, I have read many professional books. This is the second in a series of professional book reviews–possible titles for your summer reading. The reviews are in no particular order. 1. The fewer words a child hears and speaks before entering school the more likely she is to struggle in schooling. 2. Fewer books in the home puts a child at risk in reading proficiency. 3. More math homework means higher math scores. These examples (two near and dear to my heart) suggests a linear view of cognitive development. While I disagree with Tough’s use of the word “stuffing” here, I read on and found myself developing a hybrid view of these two apparently opposing hypotheses. I agree with Tough that there are many other ways to develop “executive functions” besides growing up with the advantages afforded (most? some?) privileged children. These higher-order mental abilities, such as the ability to deal with confusing and unpredictable situations, can be learned in many ways and at many points during a person’s life. “Executive functions and the ability to handle stress and manage strong emotions can be improved, sometimes dramatically, well into adolescence and even adulthood” (48). Tough cites research that was new to me. Mary Ainsworth conducted studies in the 1960s/early 1970s. She found that: “Babies whose parents responded readily and fully to their cries in the first few months of life were, at one year, more independent and intrepid babies than babies whose parents had ignored their cries” (cited in Tough 33). This may seem counterintuitive but having been that kind of parent with my own infant daughter, my experience has borne out that finding. She became a VERY intrepid toddler and grew into a VERY independent woman (now in her mid-30s). My question here is if babies are born into struggling families, does the parent who is working two jobs have the energy to respond “readily and fully” to a baby’s middle of the night cries? Tough also writes about cognitive-behavior therapy and cites the work of Martin Seligman, author of Learned Optimism, which I haven’t yet read. According to Seligman, the best time to transform pessimistic children into optimistic ones is “before puberty, but late enough in childhood so they are metacognitive (capable of thinking about thinking)” (91). My experience supports the importance of optimism and other positive emotional states when it comes to learning. As researcher David Sousa noted positive emotions affect learning by helping students process information, engage in difficult tasks, develop a deeper understanding of learning experiences, and recall and apply what is taught later on (2016). Tough analyzes the character education program at KIPP Schools. In order to prepare KIPP students for college, students are given a college persistence rating in four categories: academic preparedness, financial stability, socio-emotional wellness, and non-cognitive preparedness. This score is monitored regularly and educators/counselors provide support and interventions to keep students on track. The success rate for less-privileged students who attend KIPP schools and go on to succeed in post-secondary education suggests “character” counts. Tough concludes: “Character can function as a substitute for the social safety net that students at Riverdale (a high school serving privileged students) enjoy – the support from their families and schools and culture that protects them from the consequences of occasional detours and mistakes and bad decisions” (103). 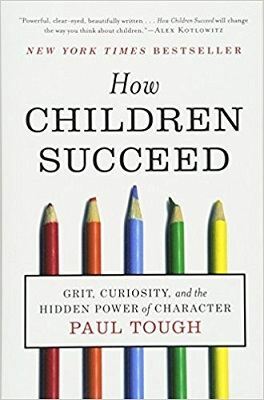 In summary, Tough writes: “Character strengths that matter so much to young people’s success are not innate; they don’t appear in us magically, as a result of good luck or good genes. And they are not simply a choice. They are rooted in brain chemistry, and they are molded, in measurable and predictable ways, by the environment in which children grow up” (196). Agreed. Agreed. Agreed. I learned a great deal from reading Tough’s book. I highly recommend it for anyone interested in child-adolescent development and education. Writing this review has helped me further reflect on the complexity of creating an environment in which future-ready children and teens can development the knowledge, competencies, and dispositions they need to succeed. In my hybrid view, the combination of family economic security, the “cognitive hypothesis,” and the “character hypothesis” could all be applied to create a supportive and effective birth through adolescence environment for children to succeed. Why not imagine and create the best of all possible worlds for our children? Sousa, David A. 2016. How the Brain Learns. 5th ed. Thousand Oaks, CA: Corwin Press. Tough, Paul. 2013. How Children Succeed: Grit, Curiosity, and the Hidden Power of Character. Boston: Houghton Mifflin, 2012.